St. Michielsgestel also has its own history of residence. Proof of Roman presence was found at Ruimel, showing that occupation of the area dates back to the very beginning of our era. You could imagine the Dommel as a strongly meandering river that often caused floods. Moreover, the sand hills showed a totally different image than the canalized river we see today, but the Haanwijk area, as it is officially called, is very lovely, despite the re-allotment of land. The landmark appears to be from a completely different time and looks almost as if it were from the 18th century, which of course is also caused by the way of building. Nieuw Herlaer, Haanwijck, ‘t Vaantje and the old farm houses all give one that idea. NIEUW HERLAAR STARTS AT OLD HERLAER. If we forget the Roman period for a while, then the history of Nieuw Herlaar starts around the year 1300. The most important nearest place is Out-Herlaer, a fortified castle built on a sand hill and centre of the local government of the bishop of Liege. His affairs consisted of, e.g., jurisdiction. The feudal lord needed his own income and thus the vassal rewarded his interference with a yearly fee consisting of money, corn or poultry. The basis of this rewarding system was called “loan”, which meant that the vassal accepted the loan provided by the feudal lord. 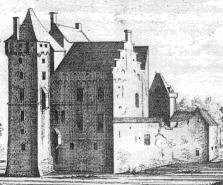 Castle Oud Herlaer and its surrounding grounds, fields and grass lands was such a loan from the bishop of Liege. Nieuw Herlaer was a loan from Oud Herlaer and therefore a subloan. The remaining building itself is not very old, it dates from the beginning of the 18th century. Only the small tower is older and was probably built in the 15th century. It is unknown when exactly the first construction was built, it is expected to be less old than Oud Herlaer which was known to exist in the 11th century or possibly even earlier. It is very likely that Nieuw Herlaer was built before the 14th century, the oldest registration of “Nyent Herlaer” dates from 1418 and even then there was hereditary succession. From that moment the history of the Lords of Herlaer can be followed. The first Lord of Herlaer is Willem van der Aa. His family ruled the castle until 1470. There is lack in the castle’s history until 1532, when another loan was given to the Proening family of Castle Deventer. Two daughters of this family, Anna and Maria van Deventer, inherited the castle and decided to split it in two halves. Maria’s half stayed in her (in-law) family. In this line family names as Pybes d’Adema and Endevoets were found. Anna’s part was sold and went from one family to another. In that case names as Millinck van Gerwen, Ruysch and Schmeling occur. The wife of the last mentioned willed her part to her sister, Genoveva Maria, countess of Welderen, who bought the second part from the wife of the last known Endevoets and thus owned the whole castle. She had it demolished in 1791 and ordered the building of a new country house instead. Only the tower remained as it was. This led to enormous debts for her and her husband and they were forced to sell the property in 1798 to Thomas van Rijckevorsel, who bought it on behalf of the diocese and turned it into a seminary. From that time on the castle served a completely different purpose. The castle remained its character as an institute, after being a seminary it was turned into an institution for the deaf and dumb (1840), a French (1912) and Austrian (1919) convent and subsequently an observation clinic for child and youth psychiatry (1955). In 1975 the clinic moved to Vught and the castle was abandoned. In 1978 construction company Van der Linden bought the castle. Today they still own the castle, which is, however, uninhabitable. The above maps show the castle’s development. It was built around 1300, L-shaped and surrounded by a double moat, which, at its turn, was surrounded by The Dommel. A chapel was built outside the castle. In 1523 a gate was added with two towers. The construction date of the walls is unknown (left map). A low point in the castle’s history was a period of neglect during the 17th and 18th centuries. At the end of the 18th century the west wing had to be pulled down. 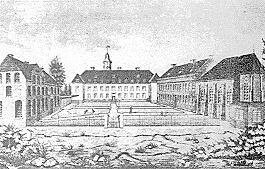 The east wing was maintained until 1791 when it was demolished (with exception of the tower) and later rebuilt. It was reconstructed and adjusted when it was put into use as a seminary several years later. During the time the castle was used as a seminary and institution for the deaf and dumb it was extensively expanded and annexed. The centre picture shows the north wing extensions (bakery of hosts) and the south wing (west convent and east chapel). Furthermore, there is a farm house and several other annexes. During the 20th century the interior of the castle was redecorated many times. During the seventies it was partly demolished again, the annexes were pulled down and the present main building appeared. The picture on the right shows the old course of the Dommel and some old parcel borders. In 1789 the west wing was sold at a public sale. Joseph Endevoets’ widow, Jacoba van der Linden, and her 5 children left the castle. She put it up for public sale to the highest bidder in the presence of city council members (at that time called de heeren Wethouderen der Grondheerlijkheid St Michiels Gestel”). The contract of sale (Coops-Conditie), written by the alderman-secretary, J. Meurs, described the contents of the sale and the conditions but also the usual procedure at such a public sale. On a Sunday in the month of August of 1789 the public sale was announced at the city hall to be taken place on August 19 and September 2. A bid of 1530 dutch florins had already been made by Wouter van Eijndhoven from Vught. This bid did not stand a chance, as everyone well knew. On August 19 people gathered in the city hall and the (down-)bid started at 3000 dutch florins. The property was sold to Wouter vd Kragt for 2300 dutch florins. He had to state that, should he stay the owner, he would strictly pay the instalments and respect all conditions in the contract. Wouter thus became the owner but there was a second auction on September 2nd. On that day a candle was lit and a chance was given to overbid. However, there were no other interested buyers (if there were Wouter may have bought them out) and by the time the candle had burnt up Wouter officially became the property’s new owner. He declared that he acted on behalf of Lady Geneveva Maria countess of Welderen., who now owned the east and west wing of the castle. Nieuw Herlaer’s address is Halder 2. 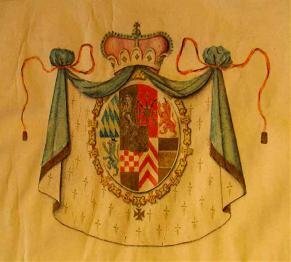 Halder was also the residence of Waltherus van der Kragt and his family, so he was probably Lady Geneveva Maria countess of Welderen’s servant.